Having Florida hurricane insurance coverage is a necessity though while it may help you to restore your property after being damaged by a hurricane it is not going to help prevent your property from being affected. It is certainly much easier and cheaper to make the extra effort ahead of time to protect your Florida property. Certainly the closer you are to the water the more you need to do to protect your home. For those in South Florida, the most at risk are considered those with homes located east of I-95. However even central Florida including Orange County and Orlando have seen hurricanes crossing the state with great force. 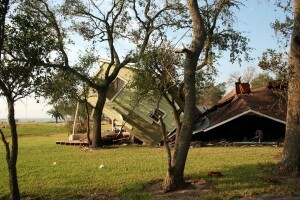 The first step in defending your home from hurricane damage is to begin by cleaning up the yard and landscaping. Trees should be trimmed at the beginning of Florida hurricane season each year to avoid weak or damaged branches from causing additional damage to your home. The area around your home needs to be cleaned up whenever there is a tropical storm approaching. Anything that could become a projectile needs to be removed. Remember it is not just your own home you need to be concerned with but not cleaning up your property and any resulting damage to neighboring properties could land you with a lawsuit. Securing the exterior of your property is crucial. If you have hurricane shutters, make sure you know how to put them up and do it quickly. If you are going to be away from your property for more than a couple days it is wise to put up your shutters just in case a hurricane is announced while you are away. If you have not yet made the investment in hurricane shutters for your home because you believe they will be too expensive, it is still worth looking into and still there are a number of Florida based hurricane shutter companies that offer financing. If you are planning on relying on plywood to protect your windows and doors when a hurricane is approaching you need to make sure that you have all the tools and equipment you need to install it and are willing to accept the damage you are going to do to the property by drilling or nailing into the exterior. The interior of your property should not be overlooked. No matter how well you think you have done at sealing up your property it is still important to pay attention to the inside of your home. Valuables that cannot be taken with you should be hidden or secured in a safe in case of looters breaking in. Water damage can also be a major issue, either from roof leaks, broken windows or flooding. You may want to raise expensive furniture from the floor or move it to upper stories. You will want to take extra care with electronics such as stereos, plasmas TVs and computers. They should definitely be removed from the floor and covered in plastic.